For the U.S. maritime industry, and for the U.S. Coast Guard, the fiscal year 1986 budget sent to Congress by President Reagan was little short of disastrous. For the U.S.
shipbuilding industry and its various suppliers and subcontractors, though, there was much good news mixed in with the bad. The reason is that, once again, the Administration is cutting back on Coast Guard programs, and has announced plans to further reduce federal assistance for the hardpressed U.S.-flag merchant marine. But funding for naval shipbuilding will stay above the $10 billion level annually for at least the next five years, and will probably not be reduced much, if any, by a Congress seeking to reduce soaring budget deficits in any way possible. The Maritime Administration (MarAd) budget story is short and bitter, and contains no real surprises. Not only is there no hint of reviving the CDS (construction differential subsidy) program, but the ODS (operating differential subsidy) program also is being cut back— from $329.5 million in FY 1985 to $299.5 million requested for FY 1986. Moreover, the FY 1986 ODS funding was requested only "to meet the federal government's obligations on existing contracts; no new contracts are anticipated" after current contracts expire. Adding more salt to the wound, from the maritime industry's point of view, is the administration's decision to seek a limitation of $900 million "on loan guarantee commitments for Federal Ship Financing." Of that total, moreover, $300 million will be held in reserve, for use only if "needed in the interest of national security." Members of Congress supportive of the U.S. maritime industry have promised to seek some legislative relief for the industry, but there seemed little hope, as the FY 1986 budget hearings began, that any additional funding for merchant marine programs will be approved during the current session of Congress. The outlook was somewhat brighter for the U.S. Coast Guard, which also has not fared too well under Reagan Administration. Congress has in the past forced through higher funding for USCG programs than the administration had requested, and may well do so again. The Coast Guard, although smallest of the uniformed services, is also perhaps the most ubiquitous, with small units and detachments in virtually every state that has any sizable body of water. Its boating safety program, search and rescue operations, and similar activities make the Coast Guard part of the civilian community and account in large part for its strong support in Congress. It will need all that support, and then some, to overcome the obstacles posed by an FY 1986 USCG budget request that, although conceding an increased workload for the Coast Guard in almost all mission areas, seeks both a funding reduction (particularly when inflation is factored in) and cuts in civilian as well as military manpower for the multi-mission service. Following are the specifics: The overall Coast Guard budget in FY 1985, the current fiscal year (which started on 1 October 1984), will be an estimated $2,517.7 million when final receipts are in; only $2,509.4 million—about $8.3 million less, in other words—is requested for FY 1986. The biggest reduction is in the ACI (acquisition, construction, and improvements) account, slashed from $346.0 million allocated for FY 1985 to $303.1 million requested for FY 1986. Included in the new ACI request is funding for, among other things, construction of one river tender and the renovation/modernization of three 210-foot medium endurance cutters and the polar icebreaker USCGC Northwind (WAGEB- 282). Largely overshadowing the bleak shipbuilding outlook for the Coast Guard and U.S.-flag merchant fleet was the continued good news in nav- al shipbuilding. Included in the Administration's overall $313.7 billion FY 1986 Defense Department budget proposal is $104.8 billion for Navy programs—and, of that, some $11.4 billion is earmarked for the construction of 23 new ships, and the conversion of five others. The FY 1986 program will be followed, moreover, by "outyear" programs of about the same magnitude for the next four years, according to FYDP (five-year defense plan) projections in the annual report to Congress by Defense Secretary Caspar Weinberger. The Weinberger report, which kicked off the Pentagon's annual "posture" hearings before Congress, projects a five-year shipbuilding program (fiscal years 1986 through 1990, inclusive) of 107 new-construction ships and 24 conversions at a price tag of just over $75.0 billion. A cautionary note, however: Outyear projections are just that—projections, and nothing more. Most such projections in the past have erred on the optimistic side. When the pressure is on, as it is now, to cut the overall federal budget the natural tendency in the White House as well as in Congress is to look at the biggest targets for immediate cuts. The inevitable result is that current- year shipbuilding programs almost always represent a reduction from the FYDP projections of the four previous years. The FY 1986 shipbuilding program runs true to form. As the Shipbuilders Council of America points out in its own well-researched analysis of the FY budget, the $11.4 billion requested for SCN (shipbuilding and conversion, Navy) "represents a reduction from last year's estimate for FY 1986 of $14.1 billion, which would have constructed 27 new ships and converted two others. Thus, a reduction of 19 percent (in current dollars) led to delay or deletion of four new ships and the conversion of three more ships than was contemplated last year." Even with that caveat, the industry has to be more than pleased with the administration's continuing commitment not only to rebuild the U.S. Navy's active ship inventory to the 600-ship level, but also to shore up such weak spots as amphibious shipping, mine warfare, and the sealift fleet—all of which had been neglected by the last several administrations (and by the Navy itself, as even its strongest supporters would grudingly concede). The FY 1986 budget continues that broad-spectrum approach, funding not only such big-ticket items as Trident ballistic missile submarines and Aegis guided missile cruisers, but also such relatively unglamorous ships as TAO-187 oilers and modestly priced LCACs (landing craft, air cushion) for Navy/USMC amphibious forces. Following—from the budget request and backup documents, the Weinberger report, and such standard sources as Jane's Fighting Ships 1984-85 and the Navy League's annual Almanac of Seapower—are thumbnail descriptions of the major ships and craft for which funds are requested in the FY 1986 budget plan: Acoustic Research Ship (AG): A twin-screw vessel capable of a 12- knot sustained speed, the AG will be converted from an existing catamaran hull (the USNS Hayes) for use in the transport, deployment, and retrieval of acoustic arrays used by the Navy for ASW (antisubmarine warfare), mine warfare, and other underwater research. The converted ship will be 246.4 feet in length and have a 75-foot beam and 21.3-foot draft. The AG will be manned by the Navy's Military Sealift Command (MSC). There are accommodations for a 36-man crew and 24 scientists. The FY 1986 budget requests funding for $86.9 million for the conversion, but does not name a prime contractor. Battleship Reactivation: The four 58,000-ton Iowa-class battleships (BBs) are probably the most overt symbols of the Administration's program to restore U.S. naval superiority. The name ship of the class, USS Iowa (BB-61), and USS New Jersey (BB-62), already have rejoined the fleet. USS Missouri (BB- 63)—on which the Japanese surrender documents were signed to end World War II—is now undergoing renovation and modernization at the Long Beach Naval Shipyard. The FY 1986 budget requests $76.2 million (including $1.0 million in research, development, test, and evaluation, or RDT&E, funding) for reactivation of the Wisconsin (BB- 64), fourth and last ship of the class. "Armed with new Tomahawk and Harpoon missiles," Secretary Weinberger points out in his annual report, "these ship are capable of striking land or sea targets from points over the horizon. Their original 16-inch guns provide a much needed boost in naval gunfire support capability." An additional $435.6 million will be requested next year to complete Wisconsin's reactivation, if current estimates hold. No shipyard has been named to carry out the reactivation/modernization program, but if the earlier public yard/private yard rotation is followed it seems likely a joint contract would be signed with Avondale Shipyards (Westwego, La.) and Litton's Ingalls Shipbuilding Division (Pascagoula, Miss), which combined on Iowa's reactivation/ modernization. CG-47 Aegis Cruiser: Possibly the most technologically sophisticated surface ship in the world, the CG-47 Ticonderoga-class Aegis fleet air defense cruiser is designed to protect the Navy's carrier and battleship task groups by neutralizing or destroying incoming enemy aircraft and missiles. The name ship in the program, USS Ticonderoga (CG- 47), performed outstandingly as part of the multinational peacekeeping force off Lebanon. Armed with SM-2 and Harpoon missiles, two 5-inch guns, and other systems, the CG-47s also will be able to meet most surface-ship and submarine threats mounted against the battle groups they protect. More than 25 Ticonderogas are planned; of that number, 16 have been previously funded. The new FYDP projects construction of 11 more through FY 1988, including three in FY 1986 (at a cost of $2,834.8 million) and three in FY 1987, ($2,988.9 million). Other specifics: displacement, 9,200 tons full load; length, 567 feet; beam, 55 feet; speed, 30-plus knots; power plant, four General Electric LM2500 gas turbines, two shafts, 80,000 shaft horsepower; aircraft, two LAMPS (light airborne multipurpose system ASW helicopters; complement, 375 (33 officers, 342 enlisted); builders, Ingalls Shipbuilding and Bath Iron Works. Carrier Service Life Extension Program: The CV SLEP program, as it is inelegantly termed by the Navy, augments the Nimitz-class nuclear supercarrier new-construction program by prolonging the operating life of the Navy's older carriers. Three CV SLEPs were funded earlier; $156.8 million in advance funding is requested for the fourth, USS Kitty Hawk (CV-63). An additional $521.9 million will be requested next year. All of the CV SLEP modernizations are being assigned to the Philadelphia Naval Shipyard. DDG-51 Aegis Guided Missile Destroyers: The Arleigh Burke-class DDG-51s, which are equipped with many of the same systems as the Ticonderogas, are designed for both offense and defense, and when deployed will be among the most heavily armed ships the U.S. Navy has fielded since World War II. The contract could be awarded at any time for the lead and name ship of the class, funded in FY 1985 at $1,189.1 million (including $139.9 million in RDT&E money). Longrange Navy plans project construction of 60 ships in the class—about half of them "improved" Arleigh Burkes. The current FYDP calls for funding 17 DDG-51s over the next five years, including two in FY 1987 (at a combined price tag of $2,246.8 million), and five in each of the three years thereafter. The FY 1986 budget request seeks $118.8 million in RDT&E funds, plus $164.3 million for advance procurement money- Some of the more important ship specifics: displacement, 8,500 tons full load; length, 512 feet; beam, 60 feet; power plant, four General Electric LM 2500 gas turbines, two shafts, 50,000 shaft horsepower; aircraft, two LAMPS helicopters; armament, Harpoon, Tomahawk, and Standard missiles, antisubmarine rockets, two 20 mm Phalanx close-in weapon systems (CIWS)—guns, two 5-inch 54-caliber guns, and two triple torpedo tubes. LHD-1 Amphibious Assault Ship: The LHD-1 Wasp-class amphibious assault ship program is described- by Secretary Weinberger as "the cornerstone of our plan to expand amphibious lift capacity." Similar in design to the already operational Tarawa-class multipurpose assault ships (LHAs), the 40,000-ton LHD- 1 is designed for the transport of troops, vehicles, and cargo. Its key feature, though, is the capacity to carry three LCACs and a large number of helicopters, both of which platforms are considered essential for assault strikes launched from safe "over-the-horizon" distances. The Wasps also could serve as "convertible carriers" for V/STOL (vertical/ short takeoff and landing) aircraft. The lead ship was authorized in FY 1984 and a contract awarded to Ingalls Shipbuilding. FY 1986 funding of $1,513.2 million (including $6.0 million RDT&E) is requested for the second of the twinscrew ships; $381.7 in long-lead funds will be requested in FY 1987. The Defense Department said the FY 1986, 1988, and 1989 ships "will be competed on a three-ship multiyear basis." Some additional specifics: displacement, 39,500 tons full load; length, 817 feet; beam, 106 feet; speed, 20-plus knots; power plant, gas turbines, two shafts; aircraft, mix of 30 helicopters and 6-8 AV-8B Harrier V/STOL aircraft; armament, not yet decided—but probably will include three 20 mm Phalanx CIWS guns. Landing Craft, Air Cushion: The smallest but in many respects most exciting of all the ship and craft in the current FYDP, the LCACs will be capable of speeds in excess of 40 knots, and will be able to operate (on a cushion of air) over land as well as on the water. Designed to carry the combat and logistical vehicles of a Marine landing force from ship to shore, the LCAC will give Navy and Marine Corps amphibious forces the ability to launch an assault, from over the horizon, in a matter of minutes. The Navy plans to buy at least 90 LCACs over the next decade or so. Of the 21 funded through FY 1985, one already has been delivered and is now undergoing a rigorous series of tests in the waters off Panama City, Fla. Fleet operations are scheduled to begin in the summer of 1986. Prime contractor for the first run of LCACs (a second source may later be named) is Bell Aerospace Textron of New Orleans. Other LCAC specifics: weight, 149.5 tons gross, 87.2 empty; payload, 120,000 pounds; range, 200 nautical miles, length, 88 feet (on cushion); beam, 47 feet (on cushion); draft, 2.9 feet (off cushion); obstacle clearance capability, four feet; main engines, four Avco-Lycoming TF40B gas turbines; complement, five enlisted personnel. LPD-4 Landing Platform Dock: The 1960s'-vintage Austin-class LPD-4s are being renovated in another SLEP program to give them another 10-15 years of useful service life and postpone their retirement until well beyond the turn of the century. "This will ease a major block retirement problem facing the amphibious fleet, "Secretary Wein- berger points out, "while supporting our goal of increasing overall lift capacity." The first LPD-4 SLEP is planned for full funding in FY 1988. The FYDP projects funds for seven renovations, but requests only $5.1 million (RDT&E money) in FY 1986. An additional $80.5 million is projected for the FY 1987 budget request. The LPD-4 mission is to transport and land troops and their equipment and supplies; the SLEP will enhance that capability by expanding the LPD-4's LCAC-carrying capacity (two LCACs instead of one) and by permitting an approximate doubling of the current helicopter spots. LSD-41 Landing Ship Dock: The Whidbey Island-class LSD-41s give the Navy an amphibious versatility it has been lacking for the last three decades. Able to carry four LCACs as well as helicopters and V/STOLs, it will be succeeded by a "follow-on LSD-41" previously called the LPDX. The latter will carry only two LCACs but will have considerably more cargo space. LSD-41s funded earlier are under construction at Lockhead Shipbuilding and Construction, Seattle, and Avondale Shipyards, New Orleans. A total of eight Whidbey Islands are projected— the six funded earlier, and two requested in the FY 1986 budget $426.5 million for the two, with additional costs of $23.5 million estimated for FY 1987). Six LSD-41 follow-ons are projected in the FYDP: two per year, FY 1988 through FY 1990, inclusive. "We anticipate construction of additional [follow-on] units in future years," Secretary Weinberger says, "to replace amphibious ships scheduled for retirement in the latter half of the 1990s." Some of the more important LSD-41 specifications: displacement, 15,726 tons full load; length, 609 feet; beam, 84 feet; speed, 20 knots; power plant, four mediumspeed diesels, two shafts, 34,000 brake-horsepower; aircraft, unspecified, but considered "helicopter and V/STOL-capable"; complement, 356 (19 officers, 337 enlisted), plus 338 troops. Mine Countermeasures Ship (MCM): The Avenger-class MCM-ls shore up another of the Navy's weak points, giving it the ability to hunt and neutralize advanced mines that cannot be countered by current sweeping techniques or platforms. Nine MCM-ls have been authorized through FY 1985; the four requested in FY 1986 (at a combined $371.1 million price tag) and one in FY 1987 ($132.8 million) will complete the planned 14-ship program. Peterson Builders, Sturgeon Bay, Wise., and Marinette Marine, Marinette, Wise., are building MCM-ls previously funded. MCM-1 specifications: displacement, 1,040 tons full load; length, 224 feet; beam, 39 feet; draft, 11.4 feet; main engines, four Waukesha L-1616 diesels (four Isotta-Fraschini diesels will be fitted in MCMs- 3 on two shafts, 2,400 brake horsepower; speed, 14 knots; complement, 72 (five officers, 67 enlisted). MSH-1 Minesweeper Hunter: A complement and follow-up to the MCM-1, then MSH-1 will be approximately 150 feet in length, displace 470 tons, and carry a crew of about 50. Capable of coastal mineclearance operations for up to five days duration without replacement, its principal mission will be according to Navy position paper, to "hunt, sweep, and/or neutralize modern enemy moored and bottom mines in a coastal scenario, to allow breakout of U.S. combatant and resupply ships from CONUS (Continental United States) military and commercial ports." A contract was awarded late last year to Bell Aerospace Textron of New Orleans for the lead ship (of a planned 17-ship class). Bell Aerospace won the $27.3-million contract with an imaginative SES (surface effect ship) design which isolates the ship, riding a cushion of air while on mission, from the shock of an underwater explosion and also significantly reduces the ship's underwater acoustic, magnetic, and pressure signatures. The FYDP projects procurement of four MSH-ls annually from FY 1986 through FY 1989; the four in FY 1986 carry a combined price tag of $187.6 million; the four in FY 1987 are projected to cost $206.0 million Nuclear Attack Submarine & (SSN-688): The Los Angeles-class SSN-688 nuclear attack submarine is 360 feet long and displaces 6,900 tons. It carries a crew of 102, is equipped with Mark 48 torpedoes as well as Harpoon and SubRoc missiles, and is considered the U.S.
Navy's primary weapon system against the huge Soviet submarine fleet. Of the 48 LA-class boats authorized through FY 1985, 29 already have been delivered and are now operating with the active fleet. The five-year program projects construction of another 18, including four in FY 1986 at a combined cost of $2,770.3 million, and another four in FY 1987 ($2,625.0 million). As is the case with all nuclear ships, the 688s have almost unlimited range, with crew endurance the only inhibiting factor. Speed is classified, but reported by Jane's to be "over 30 knots." The 127-man crew includes 12 officers, 115 enlisted. The only two yards building the 688s (or any other U.S. nuclear ships) are Newport News Shipbuilding, Newport News, Va., and the Electric Boat Division (in Groton, Conn.) of General Dynamics. Both of those companies also are competing on the design for the Navy's new SSN-21 nuclear attack submarine, which will first complement and eventually replace the 688. The SSN-21 (so named because it is being designed "to meet the Soviet submarine threat of the 21st century") will be bigger, faster, quieter, deeper-diving, more versatile, and more sophisticated in general than the LA-class 688s. More important, it will be much more advanced in most areas of submarine warfare than anything now in the Soviet inventory or likely to be on the USSR's drawing boards for some time to come. The cost of the first ship, for which full funding will be requested in FY 1989, will be an estimated $1.6 billion. Cost will drop somewhat for later units, and level off at about the $1 billion pership level with the fifth or sixth ship. It seems most likely, therefore, that the still highly classified program will be the most expensive by any measurement, in U.S. Navy history. TACS Auxiliary Crane Ship: Designed for the unloading of what the Navy terms "non-self-sustaining containerships," the auxiliary crane ships are among the more imaginative new ships and small craft which will convert the rapid deployment force concept into an operational reality. Containerships selected by the Navy and Maritime Administration for conversion into more "militarily useful" vessels, they will be assigned, after conversion, to the Ready Reserve Force (RRF), an important and growing component of the National Defense Reserve Fleet (NDRF). During National emergencies the RRF ships would be activated and assigned to the Military Sealift Command. The twin-boom pedestal cranes added during the conversion process (some ships may have two twin booms, others three) will give them a self-unloading capability, and also permit them to offload other ships "in the stream" or in other areas where port facilities are inadequate. Funding ($84.9 million) is requested in the FY 1986 budget for three conversions; another two conversions are projected for FY 1987, at a combined cost of $68.7 million. The final two crane ships, of a projected 11-ship force, are programmed for FY 1988 funding. The first TACS, the ex-SS President Harrison, was converted by Bay Shipbuilding, Sturgeon Bay, Wis., and renamed USNS Keystone State. The second, ex-SS President Monroe, is undergoing conversion at Continental Maritime, San Francisco, and will be named Gem State. Contracts for the other conversions will be awarded "on a competitive basis." Ship specifications will differ within the class itself (because the hulls converted will not be identical to start with), but most will be close to the first two: 17,782 deadweight tons; 686.6-foot length; 76.1- foot beam; 33.5-foot draft; 20-knot speed SURTASS TAGOS: The civilianmanned Surveillance Towed-Array Sensor System (from which the unwieldly "SURTASS" is derived) ships are another of the key elements in the overall ASW mosaic designed to counter the unprecedented Soviet submarine threat. The systems they carry and the specific work they do is classified, like all else in the ASW field. But the Navy concedes that their principal mission will be "to support the towed arrays and data processing/ transmitting equipments of the SURTASS system," and Secretary Weinberger told Congress in his annual report that the long-range surveillance capabilities of the TAGOS ships "will be useful both for extending coverage to ocean areas not presently monitored by fixed systems and for providing backup coverage in areas that are routinely monitored, should our fixed systems be incapacitated." The "fixed systems" the SecDef referred to probably are the seabed sensor systems, also highly classified, positioned in the GIUK (Greenland/ Iceland/United Kingdom) Gap in the North Atlantic and presumably in such other oceanic chokepoints as the Bosporus and Dardanelles, Skagerrak and Kattegat, La Perouse Strait, the Strait of Gibraltar, etc. Congress has approved funding for 14 TAGOS ships through FY 1985. Two more are requested in FY 1986 ($121.0 million for the pair), and two more will be requested next year ($119.0 million). Contractor for the first 12 of the twin-screw, 11-knot, geared diesel ships is Tacoma Boatbuilding, Tacoma, Wash. Contract(s) for the final six conversions will be awarded on a competitive basis. The lead ship, USNS Stalwart (TAGOS-1— the " T " in MSC ship designations indicates the ship is civilian-manned), already has been delivered and is operating out of Key West, Fla. Some of the more important unclassified specifications: displacement, 2,500 tons; length, 204 feet; beam, 42 feet, complement, 20 civilians 10 Navy personnel. 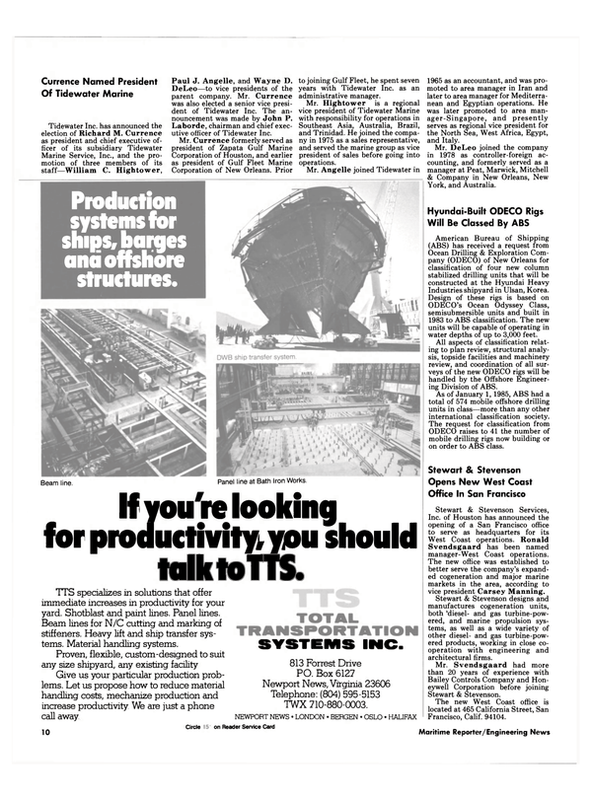 Fleet Oiler (TAO): The TAO-187 Henry J. Kaiser-class of fleet oilers is designed, Secretary Weinberger told Congress, "to relieve an existing shortage of oilers, while providing replacements for the 30-year-old vessels now operated by the Military Sealift Command." Seven TAO-187s previously have been authorized. The FYDP projects a twoper- year funding rate for the next five years. The two requested for FY 1986 will cost $330.5 million, the two in FY 1987 an estimated $374.9 million. A corollary program, to increase the fuel-carrying capacity of the Navy's five Cimarron-class (AO- 177) fleet oilers, will begin in FY 1988. Avondale Shipyard is building the first four TAO-187s; contracts for the other ships in the planned 18-ship force will be awarded on a competitive basis. Specifications: displacement, 40,000 tons full load; length, 677.5 feet; beam, 97.5 feet; speed, 20 knots; power plant, two fully automatic diesel engines, twin shafts, 32,000 shp; complement, 137 (106 MSC civilians and 21 Navy command, control, and communications personnel—10 "transient" spaces also are available); cargo capacity, 180,000 barrels of gas turbine and marine diesel fuel. TAVB Aviation Logistics Support Ship: Another program developed with the rapid deployment force in mind, the TAVB conversions will modify two combined container/ RO-RO (roll-on/roll-off) ships to give the Navy and Marine Corps two ships capable of lifting and supporting a Marine Intermediate Maintenance Activity (IMA). The IMA in turn is designed to maintain, repair, and otherwise support the USMC's fixed- and rotary-wing aircraft likely to be used on amphibious missions. The TAVBs will be assigned, following conversion, to the Military Sealift Command, which will keep them in a reduced operating status—but ready for activation on short notice. Todd Shipyards Galveston is converting the lead ship; the FY 1986 budget requests $31.4 million for the second conversion. The converted ships will be 603 feet long, have a 34-foot draft, and be capable of a sustained speed of 23.5 knots. Trident Ballistic Missile Submarine: Equipped with 24 long-range ballistic missiles, the Trident SSBNs (nuclear-powered ballistic missile submarines) are probably the most important—because they are the most survivable—element in the U.S. strategic deterrent "triad" of manned bombers and land-based and sea-based strategic missiles. Bigger, more capable, more lethal, and considerably more expensive successors to the earlier Polaris and Poseidon SSBNs, the Ohio-class Tridents have been designed for a nine-year operating cycle between overhaul/refueling periods. Congress has authorized 12 Tridents through FY 1985, and the Defense Department plans to continue the current one-ship-per-year building program until the planned goal of two dozen ships or so (the plan changes, as administrations change) has been completed. The Electric Boat yard of General Dynamics has been prime contractor for all of the Tridents already delivered or now building. The FY 1986 budget seeks $1,764.0 million (including $56.6 million RDT&E and $161.0 in military construction money) for the Trident shipbuilding program (not to be confused with the Trident missile program, for which over $2 billion is requested) and projects a request for an additional $1,754.9 million in FY 1987. The specifications for this mightiest and, except for the Navy's nuclear carriers, highest-cost ship in the U.S. fleet: displacement, 18,700 tons dived; length, 560 feet; beam, 42 feet; power plant, one nuclear reactor, geared turbines, one shaft, 60,000 shaft horsepower; complement, 133 (16 officers, 117 enlisted); armament, four torpedo tubes, in addition to the Trident missiles. In addition to all of the preceding, the FYDP projects funding within the next five years for a number of other ship types, including multipurpose stores ships (AOE-6-class, one of which will be requested in FY 1987, at an estimated price of $756.6 million), ammunition ships (AE- 36s), and repair ships (ARS). Perhaps the "most interesting" aspect of the new SCN budget, though, according to the Shipbuilders Council, is that it also includes $203.4 million "for the acquisition of  commercially obsolete merchant ships for the Ready Reserve Force"—which Secretary Weinberger told Congress is projected "to grow to 116 ships (100 cargo ships and 16 tankers) by the earlv 1990s. "This represents an increase of 39 ships over previously planned [RRF] levels," Secretary Weinberger also said—pointing out that the increase was "necessitated by a continuing decline in the breakbulk component of the civil fleet." From the taxpayer's viewpoint it probably is "most interesting," as the Shipbuilders Council put it, that federal funding is being used to buy merchant ships for possible future Navy use, but cannot be used to keep other merchant ships operational for civilian purposes.